Population - Around 65,000 making it Goa's third largest city. Climate - Tropical monsoon climate. Winter Dec-Feb, 20'C+; summer March-May, 28'C+; monsoon June-Sept, heavy rain, warm. Location - Tiswadi taluk (district) in north Goa. Panaji (also commonly referred to as Panjim) is the capital city of Goa. It is located on the banks of the Mandovi River and is an attractive city with wide, leafy avenues, atmospheric old quarters and some great places to eat and shop. Resulting from its period of colonial rule, Panaji's has a vaguely European feel. In 1843 Panaji officially replaced Old Goa as the seat of administrative powers in Portuguese Goa, completing its transformation from small, riverside fishing village into a grand and affluent city. 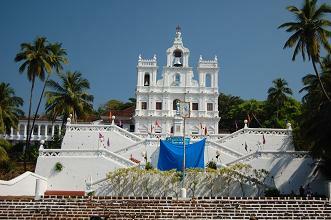 The Portuguese influence remains in Panaji's old colonial-era quarters, and in its striking churches. Church of Our Lady of the Immaculate Conception Looming over the heart of Panjim, this salvation-white chuch was built in 1541 so that sailors from Lisbon could give thanks before proceeding to Old Goa. It was enhanced in 1871 with the addition of a belfry and the impressive steps that lead to its entrance. Open Mon-Sat 09:00 to 13:00 and 15:30 to 18:00, Sunday 10:30 to 13:00 and 18:15 to 19:00. Fontainhas and Sao Tome (Old Quarters) Between Ourem Creek and the Church of Our Lady lies Sao Tome and, a little further south, Fontainhas. Expect to see balconies decked with bougainvillea, narrow cobbled streets, random mosaics and pretty red-tiled houses in Panaji's most atmospheric quarters. If you are looking for a drink, head to Sao Tome's many small taverns. 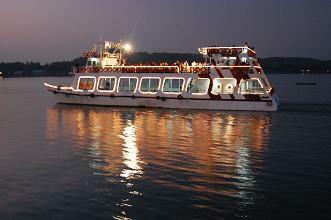 River Cruise Departing from the Santa Monica Jetty (near the Mandovi river bridge on the city side) evening cruises are a pleasant way to spend an evening, and are hugely popular with domestic tourists. Prices range between R.100-R.300, can be booked on the day, and there is usually a bar on board. Shopping Panaji is the best place to go if you are looking for Western brands at cheap prices. It is also a good place to stock up on quality underwear and basics which can be hard to find elswhere. Local products and souvenirs include cashews, azulejos (Portuguese painted tiles) and feni (strong Goan liquor). Panaji sits on the south bank of the Mandovi river with most areas of interest lying beyond the west bank of Ourem Creek that adjoins the Mandovi. If you are arriving by rickshaw or taxi, you will find the Church of Our Lady of the Immaculate Conception a good drop off / pick up point. Taking Rua Jose Falcao north will lead you to the river, or head-south east along Emilio Gracia Rd to the districts of Fontainhas and Sao Tome. Pop in to the India Tourism Office on church square (across the road from the Immaculate Conception church) for Panaji travel information and maps. Closed on Saturday afternoons and all day Sunday. The nearest train station to Panjim is Karmali near Old Goa, and many travellers arrive here by bus, coach or hired transport. The Kadamba Bus Stand is to the east of town - rickshaws from here to the town centre should be inexpensive (around R.30) or a 20 minute walk. Goa's Dabolim Airport is a 45 minute taxi ride away, and will set you back in the region of R.500. Local buses from Panaji travel all over the state, so it is a good place to reach if you are looking for cheap onward transport. There are numerous places to eat in Panaji, with the popular south Indian canteen-style cafes (great for cheap breakfasts and snacks) all over town. For dinner, try the atmospheric Venite on Rua 31 Janeiro Road (in Sao Tome, near the bay). Tiny balcony tables give a view of the street below, and Goan seafood is on the menu. Another place that oozes character is Viva Panjim on the same street but further down in Fontainhas, where you can enjoy fine Goan home cooking. Many visitors to Panaji travel in for the day and return to one of Goa's beaches at night. There are a some very good accommodation options in town however, and if you are not pressed for time an overnight stay can give you a greater chance to explore and soak up the atmosphere, especially of Fontainhas, Panaji's old quarter. Try Afonso on St Sebastian Chapel Square (Fontainhas) for a mid-range option, or Panjim Inn for an atmospheric (if a little financially draining) stay. Completely different yet equally fascinating, Goa's busy market town of Mapusa throws first-time foreign visitors to India right in at the deep end! 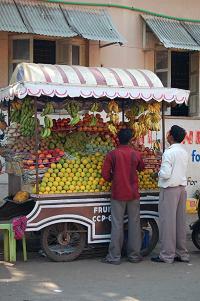 See more inland Goa attractions.